A Belle Epoque Courtesan, a Bloomsbury artist and a patron of Australian art? As I’m editing my sixth novel, which has nothing to do with anything in the title above, I find myself asking, what is it that the three women who inspired my first five novels have in common with each other, if anything at all? 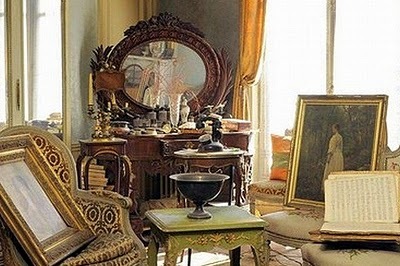 Martha de Florian was a Belle Epoque courtesan whose apartment in Paris was famously abandoned from 1940 when her grand-daughter fled Paris on the eve of the Nazi invasion until 2010 when the executors of her estate entered it for the first time in seventy years. Martha looms, the secret behind the story in Paris Time Capsule and The House by the Lake…the woman whose apartment is the backdrop for the novels, and whose ghost seems to linger in the walls. In From a Paris Balcony, we meet Marthe as a young woman, powerful, at the peak of her career as a courtesan. Marthe befriends the young Henry Duval, husband of Louisa in 1890’s Paris. When I was researching Marthe, I was intrigued to learn that Parisian courtesans are now regarded as some of the first women ever to run their own lives…and yet they bore the stigma of being fallen women- nothing more in the eyes of society than high class prostitutes who were mostly Parisian seamstresses, desperate as young girls. The successful courtesans were a threat, a terrible threat to the status quo, with their flashy ways, and their methods of infiltrating high society. These women were at the races at Longchamps, at the Opera on a Monday evening, sitting in the most exclusive boxes at the theatre, province of only the most wealthy and high class families at the time-wherever the highest classes were, that’s where you’d find these courtesans. Their lovers were, famously, European royalty, prime ministers and other wealthy businessmen and aristocratic men…they were women who were able to make their way up the classes, and who made money on their own terms at the cusp of the modern world, but look how they had to do it. And what about the third, unconventional, fascinating woman who has been alongside me for these past three years? I was so kind of thrilled when I read recently that Sunday Reed’s life is comparable to Vanessa Bell’s…that was after I’d written THE THINGS WE DON’T SAY, which is inspired by Bloomsbury artist Vanessa Bell, and her relationship with fellow early twentieth century artist Duncan Grant. Vanessa and Duncan were of the generation who lived through two world wars, who grew up in a world where gay men were outlawed, where to hold onto any beliefs other than the conventional could mean prison, or at the least, great exclusion from society as a whole. So, Vanessa and Duncan, who was gay, set up a beautiful farmhouse in Sussex called Charleston, where they tried to set up their own unconventional lives. They were both deeply sensitive artists who lived and worked together for most of their adult lives. Their values- tolerance, pacifism and respect for all people no matter their colour or religion underpinned the Bloomsbury group, a gentle group of philosophers, artists and writers, and yet, in spite of their philosophies they were not, ultimately able to avoid the pain and suffering that inevitably is part of our lives…but like Marthe and Sunday, Vanessa has left us with one of the most beautiful examples of a house lived in unconventionally- Charleston, a treasured farmhouse on the edge of the Sussex Downs. The house is filled with their work- they’ve decorated every surface and left us a legacy of beautiful art. What have I drawn from this? From spending three years alongside the memories of these remarkable women, who, of course, all tried to forge a life that was original, and entirely their own, all challenged the status quo, all questioned some of our traditional values, all suffered as their emotions conflicted over and over with the beliefs and values they tried to uphold. I’ve learned to respect and admire and love the memories of these women who left us beautiful, enigmatic spaces and in the case of Vanessa and Sunday a legacy of art which has intrigued and fascinated people. I have come to value, so much, the choices that we have today. I don’t think I’ll ever take them for granted again. Your wonderful imagination, love of beauty and beautiful people, all combine you into an exquisite author! I love your books ~ each and every page ~ from beginning to end. Thank you for your exquisite work. I anxiously await your next adventure!! So well said. Your stories and characters stay with me as well. They offer a glimpse into other lives and times and I have enjoyed each journey you have taken me on.